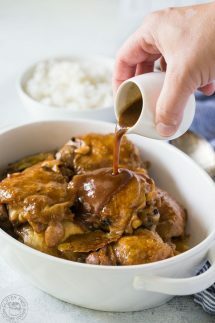 Instant Pot Chicken Adobo – you guys I’m SO excited about this recipe as it is effortless to make, contains ingredients you’ll already have in your pantry and it tastes fantastic! 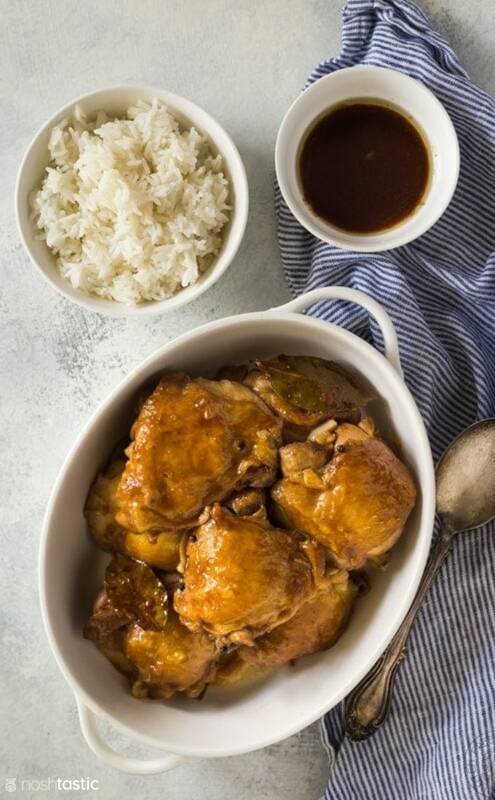 I also cooked my Instant Pot Chicken Adobo with rice using the ‘pot in pot’ method which allows you to cook the rice separately in a small pot inside your pressure cooker with the chicken. Chicken Adobo is a very popular dish that originates in the Philippines. The main ingredients are meat, in this case chicken, which is marinated in vinegar, soy sauce, black peppercorns, and bay leaves. Then the chicken is cooked in the marinade and served hot, often over rice. 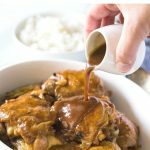 How do you make Filipino Instant Pot Chicken Adobo? Start by mixing together the vinegar, gluten free soy sauce (or coconut aminos for Paleo) garlic cloves cut in half, black peppercorns and bay leaves. Next, immerse the chicken thighs in the marinade and marinate for 1 hour, turning the chicken pieces after 30 minutes. 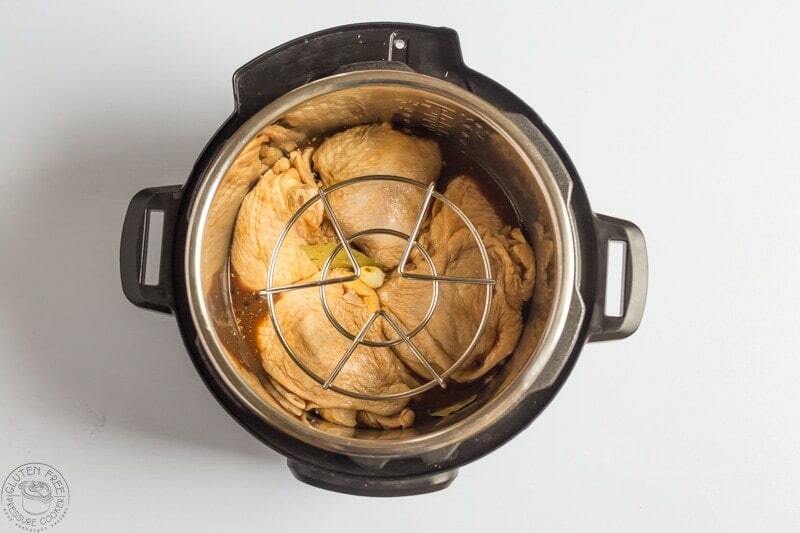 Then add the chicken to your pressure cooker with the remaining marinade and cook at high pressure for 8 minutes and allow a full natural pressure release which will take about 15 minutes. 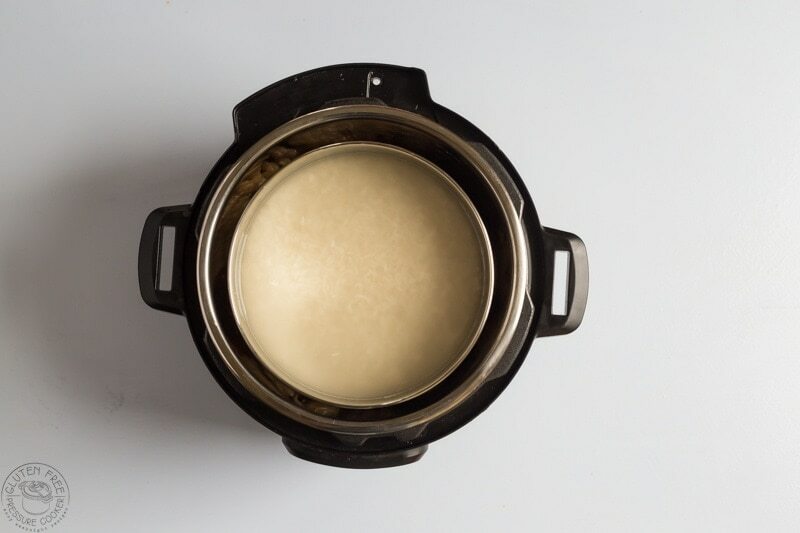 ‘Pot in pot’ rice is the popular name that Instant Pot fans give to the method of cooking rice in a small container inside your electric pressure cooker. In recipes where the cook time for the rice and the main meal are similar this makes it an easy way to cook them at the same time. In order to cook the rice with your Instant Pot Chicken Adobo you’ll need a long legged trivet to allow your ‘pot’ to sit above meat. You’ll also need a container like this stainless steel stackable pot for the 6qt Instant Pot, or this Stainless Steel pot one for the 8 quart model. First, rinse your white rice and add it to your container and and put the cover on. The water to rice ratio is approximately 1:1, so one cup of rice to one cup of water. I prefer to add a tiny bit more water so I added an extra tablespoon of water per cup of water, that’s a measuring cup not a rice cup! I cooked two cups in my 6qt insert, it was not big enough to cook more. There is a cover for the insert pot below so make sure you use it. Should the chicken thighs be boneless and skin-on or bone-in?. Hi Kristen, I made it with skin on and bone in. If you used boneless you’d need a much shorter cook time.